A working-class movement for political reform | A balanced diet . . .
Less than 4 miles by road west of Bromsgrove in northeast Worcestershire (much less as the crow flies) lies the village of Dodford. Nothing remarkable in that, you might say. Well, until 1849, the village didn’t even exist. The area was known then as Greater Dodford, but became a community (of sorts) when a ‘village’ of more than 40 redbrick cottages (like the one below, known as Rosedene) was built, each in its own 4 acre plot of land. That’s significant. Rosedene was built by the Chartist Cooperative Land Company, and the Dodford community was the last of five that were set up around the country by Irish Chartist leader Feargus O’Connor. So, what was Chartism and who were the Chartists? Communities like Dodford were established to help working-class people satisfy the landholding requirement to gain a vote in county seats. That’s why each cottage was built on 4 acres of land, the minimum at the time to satisfy the landholding requirement to make a man eligible to vote. O’Connor purchased a farm of more than 250 acres at Greater Dodford, and divided it into 4 acre plots for each cottage. The lanes around Dodford remain as narrow today as when first opened in the 1840s. Potential occupants placed bids for the cottages, with the highest bidder receiving the ‘choicest’ plot, and so on until all plots had been allocated. Having walked around the plot at Rosedene, I can vouchsafe that it’s a large plot for one family to manage. Many of those who came to Dodford were working class families from the cities, with little experience of agriculture. What they encountered at Dodford was a very heavy clay soil that was extremely difficult to cultivate. Eventually however, they established that strawberries did grow well, and opened up a market to Birmingham for their produce. Likewise, garlic thrived, which they sold to the makers of Worcestershire Sauce, Lea & Perrins, in Worcester, 15 miles to the south. By the time Dodford was built, O’Connor had perfected his simple cottage design. Each cottage had a simple central living room with a range for heating and cooking, with a bedroom off to each side. To the rear was a small scullery and an indoor water pump. The ash toilet was in an outhouse (much like my grandparents’ cottage in Derbyshire that they occupied until the early 1960s). Maybe there was a pig sty attached to the enclosed small yard. Behind the cottage there is a small barn. Bricks for each cottage were made on site. Rosedene sits on foundations of stone. I did wonder whether stones from the 12th century priory nearby (now incorporated into a farmhouse) had been used for this purpose but there is no record of that being the case. O’Connor’s design included the ‘modern’ feature of air vents low down on the walls and into the roof to reduce condensation. 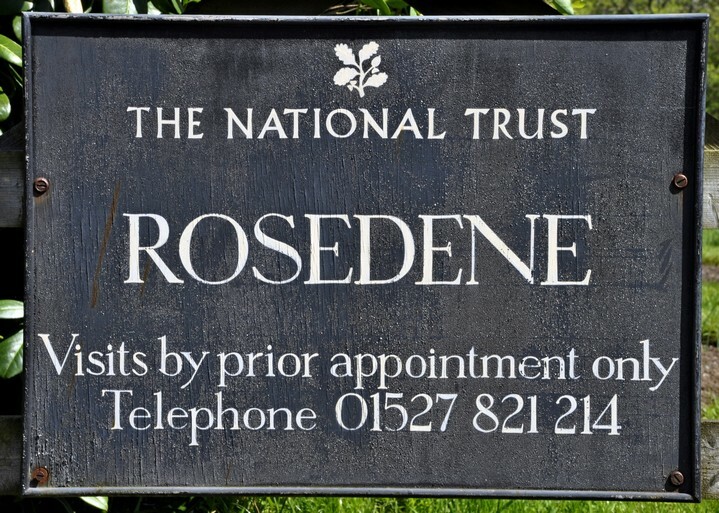 The National Trust purchased Rosedene in 1997 and has faithfully restored it. We visited the cottage a week ago. There is only limited access on the first Sunday of each month between April and December (on pre-booked tours). Unfortunately, the National Trust volunteers waiting to welcome us to Rosedene were unable to unlock the property so we never got to look inside, apart from peering through the windows. However, you can see something more of the interior here, which also provides a potted history of Rosedene. This entry was posted in Out and about and tagged Chartism, Chartist, Dodford, National Trust, Rosedene.